What happens when a nose cuts loose to spite its face? 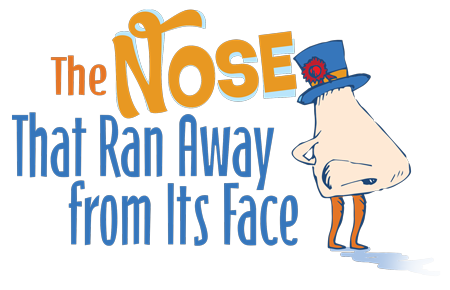 Inspired by Nikolai Gogol’s absurd short story The Nose, this quirky, comedic journey begins when a giant sneeze separates a young boy and his pun-loving proboscis (that means “nose” to those in the “knows”). The sassy schnozzle celebrates his newfound freedom and the commercial possibilities that come with it, entertaining job offers from an ENT doctor and a florist. Meanwhile, the boy frantically searches for his wandering facial feature and struggles to come to terms with his nose-less identity. That is, until he encounters a string of sympathetic adults who show their concern by giving him gifts of candy, coins, and more. Read more...Just as the boy begins considering life without his sniffer, a group of townsfolk ready to thumb their nose at establishment leadership during a political rally sees hope in both the boy and the nose’s symbiotic messages of honesty and change. But are the boy and his nose better together than apart? That answer, of course, is as plain as the nose on your face.